This was a pretty unique episode I thought. First off, let me say I love talking with the younger people out there as it sets a great example of why age should not be an excuse as to why or why not you are doing something. 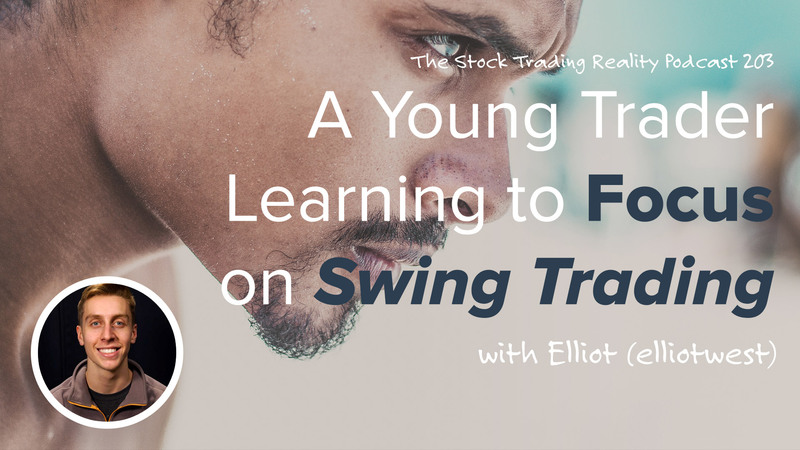 When it comes to the markets in particular, the younger you start… the better! This is not my opinion, it’s a mathematical fact. I talk with Elliot (in the chatroom he goes by ‘elliotwest’) and we have ourselves a great conversation, although you will notice as I press him about certain topics, he seems a bit… lost. However, in other areas of the conversation you’ll notice he answers me with authority and a plan of action, which leads to some real life coaching to help bump him in the right direction. Sure he’s a younger guy, but no matter your age I’m confident you’ll be able to relate in one way or another and pull some wisdom from the conversation. Today we talk with Elliot from the community. He was aware you could purchase shares of a company but wasn’t really sure how to profit from that. In high school, he decided that he wanted to make a living working from his computer at home. Stock trading was one of the jobs that popped up in his search. Elliot decided to do his research on Clay after he found his videos on YouTube. He watched all the videos for almost a year before enrolling in Claytrader University. His logic was that if he was still interested a year later then this was something he truly wanted to do. He decided to start trading relatively quickly but suffered some silly losses which led him to take another hard look at his technical analysis and risk management. Elliot stepped back since he realized he started live trading a bit too fast. Elliot started to see the true power of the market after making some profits and he also has a good handle on keeping his losers small and pushing his winners as far as they’re willing to go. Considering he is subject to the pattern day trader rule, he wants to focus more on swing trading momentum stocks going forward. I learned at a young age that you could buy shares of a company and I thought that was pretty cool but I didn’t really know much about that. I tried to find things on you that would hurt your character, no offense. I tried to see if there was anything bad about you online. If I lost it all I wouldn’t be broke. I would be bummed out but I was okay mentally with losing it. My goal was to start investing in my retirement before 21. Before I can drink I need to start investing. Losses kind of bum me out but I’ve come to learn you need to take the loss to get your money back and put it into another trade.